"mud mud mud mud mud slipply slabs mud mud mud"
This was Penistone Hill on a good day. Gale force winds and driving rain, but this couldn't put 19 year old England international Tom Addison off his stride as he won this race for the third year running. Ian Nixon ran his way into second place, while Andrew won the V40 framed picture yet again, and in ninth, 2002 winner Steve Oldfield retained the V50 picture for the fourth year running. It would seem that besides being covered in mud from the Skyline terrain, far too many runners were reporting back about a missing paving stone just above Top Withins Ruin, which caused some deep and meaningful discussions with the ground, luckily no serious issues were encountered, however we will be getting in touch with the countryside commission and this 'tombstone' sorry, paving slab will be replaced forthwith. British and English under 23 fell champion Emma Clayton won the ladies race finishing 42nd overall, 21 year old Emma had Anne Johnson and Haworth GP Jo Buckley for company at Withins Ruin, but like Tom she was far too fleet of foot winning with a minute in hand. Rat finks away as fifty one under 8 athletes were off at break neck speed along the grassy quarry bottom. 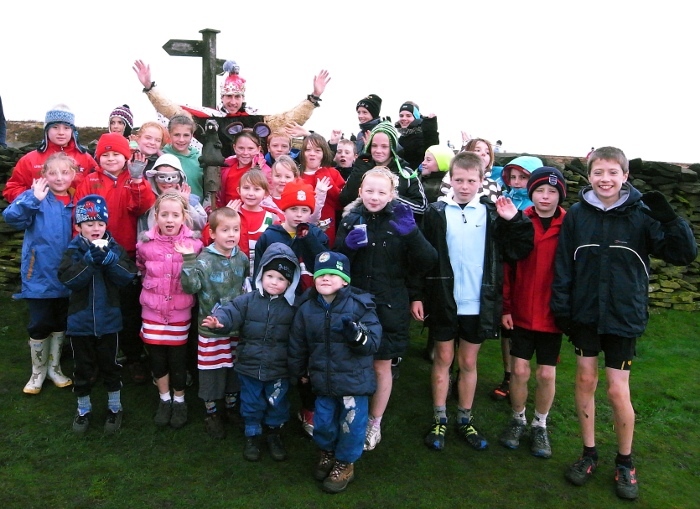 Ninety youngsters took part in the combined U10, U12, U14 and U16 races, an encouraging 21 up on last year. Sunday 25th October 2009. The 18th Withins Skyline BM - 7m/1000' from Penistone Hill Country Park, near Howarth, W Yorks (GR 025364). Race starts 11.30am, entry £3 on the day only. PM/NS Over 18. Records 41.28 Alistair Brownlee 2006, f 48.39 Jo Waites 2006. Cadbury's Curly Wurly to all finishers. Free coffee and biscuits. Google Map of the course (same as 2008). Sunday 25th October. CS. Venue as above, starts from 10.30. £1 entry on the day only. U8 (over 6) 0.5m/100'; U10/12/14 1m/150'; U16 2m/300'. See the Quarry Runs page for records and a course map. Abbey Runner Mike Ayres of Precision Pest Management Solutions Limited has kindly agreed to sponsor these races again in 2009. The junior 'Rat Runs' at the Withins Skyline senior race once again had prizes to the first three boys and first three girls in U8, U10, U12, U14 & U16 age categories, with an extra bonus of a chocolate or toffee apple. All category winners, boys and girls also received a Halloween severed fresh foot in a tray, very gruesome and bloody, but honestly NOT REAL! All finishers received the 'famouse' ratty Curly Wurly goodie bag, a treasure trove of delights including a Cadbury's Curly Wurly, a bag of Walkers crisps, a tongue painter lollie, Fizz Wiz popping candy sachet and a sugar mouse, plus a carton of pop to wash it all down with. The winning entry in the poster/certificate competition had pride of place in the goodie bag. For those who wanted to participate in fancy dress then there were six prizes for the best according to the theme – ratty, mousey, pesty type fancy dress or halloween type fancy dress or best of all ratty, mousey, pesty halloween type fancy dress. All junior runners were entered in a free prize draw with a tin of Cadbury's Heroes, a frightening "Heads Off Harry", and Cadbury's Selection boxes as prizes. Finally the finale to the prize giving was the 'famouse' chocolate throw out, which just has to be seen to be believed! It's the R-Factor Finals! All the fabulous entries are in, King Rat Mike Ayres has judged them, and the Grand Prize winner is .... Rosie Hellawell aged 15 of KCAC - click on the thumbnail to see her poster which will be turned into a race certificate in all Goody Bags. Rosie wins loads of chocolate and sweets, and there are prizes for 1st girl Beatrice Toman, 2nd girl Zoe Kitching, 3rd girl Gabriel Scobie, 1st boy Matthew Toman, 2nd boy Toby Kitching, and 3rd boy Logan Hargreaces-Mashas. All the entrants win prizes too! 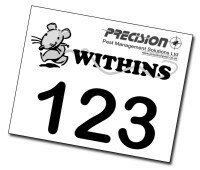 Prizes will be presented at the Withins Curly Wurly Rat Run. You can see all the rat-tastic entries here.